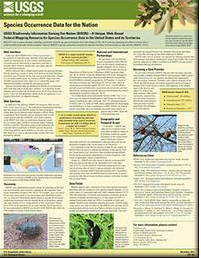 USGS Biodiversity Information Serving Our Nation (BISON) is a unique, web-based Federal mapping resource for species occurrence data in the United States and its Territories. Researchers collect species occurrence data, records of an organism at a particular time in a particular place, as a primary or ancillary function of many biological field investigations. Presently, these data reside in numerous distributed systems and formats (including publications) and are consequently not being used to their full potential. As a step toward addressing this challenge, the Science Analytics and Synthesis (SAS) program of the U.S. Geological Survey (USGS) is developing Biodiversity Information Serving Our Nation (BISON), an integrated and permanent resource for biological occurrence data from the United States. BISON will leverage the accumulated human and infrastructural resources of the long-term USGS investment in research and information management and delivery. Read the DOI Official Press Release in which BISON's public debut was announced. 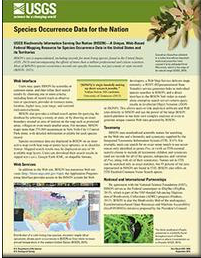 The USGS SAS program is also the U.S. Node of the Global Biodiversity Information Facility (GBIF), an international, government-initiated and funded effort focused on making biodiversity data freely available for scientific research, conservation and sustainable development. USGS SAS hosts a full mirror of the hundreds of millions of global records to which GBIF provides access. BISON was first released in April 2013 and included 110 million records made available through GBIF from the U.S. and U.S. Territories. In November, 2015 BISON passed the 260 million record count and is continuing to integrate millions more records from other sources each year. Biodiversity Information Serving Our Nation (BISON) is committed to providing free and open access to primary species occurrence data. Data currently available through BISON are contributed by various U.S. Federal and State agencies, universities, and non-profit organizations, either directly to BISON or indirectly through their participation in the Global Biodiversity Information Facility (GBIF). GBIF Participants who have signed the GBIF Memorandum of Understanding have expressed their willingness to make biodiversity data available through their nodes to foster scientific research development internationally and to support the public use of these data. GBIF data sharing should take place within a framework of due attribution. Therefore, using data available through BISON requires agreement with the BISON Data Use Agreement that is displayed prior to a data download. Refine Your Search Previous Search This returns the page to the previous search performed before the current view. Clicking at (0) available searches simply refreshes the search at the default level of "all species"